Join the fastest-growing international tax preparation franchise in the industry! 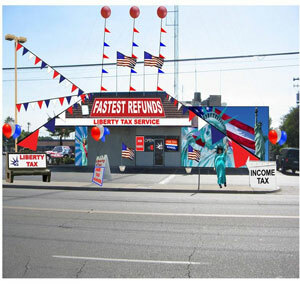 This Liberty Tax office has been a staple in the community and has a prime location with high traffic visibility catering to both businesses and individual clients. Founded by John Hewitt in 1997, Liberty Tax has a proven system that allows you to tap into a wealth of tax industry experts! Work hard for months and then spend the next 8 pursuing other interests! Every year, Americans are faced with the prospect of tax return preparation. Although many will try to go it alone, more turn to a tax consultant like Liberty Tax. Liberty's goal is to provide the feeling of a personal tax consultant alongside the security, confidence, and protection that a large company can provide. Liberty Tax continues to firmly establish its growing presence and increasing market share in the personal income tax industry. One of the things that makes Liberty Tax unique is how supportive it is of its franchisees. The Liberty franchise system has consistently been recognized as a leader among all franchises, not just personal income tax based businesses. Liberty has been awarded a top spot among franchises by magazines such as Black Enterprise, Poder/Hispanic Enterprise, and Military Times Edge. Accounting Today named Liberty Tax to its "Top Tax Firms" list. Liberty Tax Service has been ranked as one of the top franchise opportunities on Entrepreneur magazine’s annual Franchise 500 every year from 1998 to 2013. Founder and CEO John Hewitt is a nationally recognized name in the tax return preparation and accounting world. He is a veteran of 44 tax seasons, the founder of two top tax preparation firms, and a former H&R Block regional director. Accounting Today magazine has named Hewitt one of the accounting profession’s top 100 most influential people twelve times. The International Franchise Association honored Hewitt as its Entrepreneur of the Year.